The story of the Liberators of the Ninth Minnesota, the state’s “hard luck” Civil War regiment, from defying orders and saving a slave family, through bitter defeat and imprisonment, to the ultimate victory and their lives in postwar America. Soldiers in the Union Army volunteered for many reasons—to reunite the country, to put down the southern rebellion. For most, however, slavery was a peripheral issue. Sympathy for slaves often came only after the soldiers actually witnessed their plight. In November 1863, thirty-eight men of the Minnesota Ninth Regiment responded to a fugitive slave’s desperate plea by holding a train at gunpoint and liberating his wife, five children, and three other family members who were being shipped off to be sold. But this rescue happened in Missouri, where Union soldiers had firm orders not to interfere with loyal slaveholders. Charged with mutiny, the Minnesotans were confined for two months without being tried. Their case was even debated in the U.S. Senate. This remarkable and unprecedented incident remains virtually unaknown today. 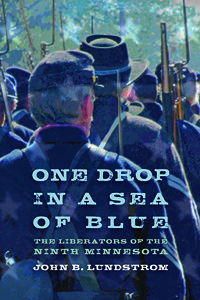 One Drop in a Sea of Blue is the story of these thirty-eight liberators and of the Ninth Minnesota through the entire Civil War. After a humiliating defeat at Brice’s crossroads, Mississippi, many were held at Andersonville and other notorious confederate prisons, where the Ninth Minnesota as a whole suffered a death rate exceeding 60 percent. Yet the regiment also helped destroy the confederate army of Tennessee at Nashville and capture mobile. In August 1865, when the Ninth Minnesota was mustered out, only fourteen liberators stood in its ranks. With vital details won through assiduous research, John Lundstrom uncovers the true stories of ordinary men who lived and died in extraordinary times. John B. Lundstrom, curator emeritus of history at the Milwaukee Public Museum, is the award-winning author of Black Shoe Carrier Admiral and four other books of military history.